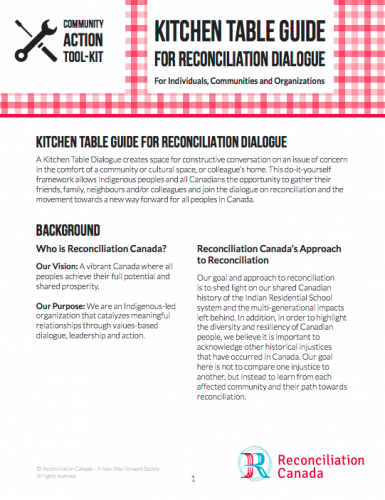 A Kitchen Table Dialogue creates space for constructive conversation on an issue of concern in the comfort of a community or cultural space, or colleague’s home. This do-it-yourself framework allows Indigenous peoples and all Canadians the opportunity to gather their friends, family, neighbours and/or colleagues and join the dialogue on reconciliation and the movement towards a new way forward for all peoples in Canada. Our goal and approach to reconciliation is to shed light on our shared Canadian history of the Indian Residential School system and the multi-generational impacts left behind. In addition, in order to highlight the diversity and resiliency of Canadian people, we believe it is important to acknowledge other historical injustices that have occurred in Canada. Our goal here is not to compare one injustice to another, but instead to learn from each affected community and their path towards reconciliation.